We're excited to announce that we're working with Telstra Play Smart™ to help combat cyber bullying and teach basketball skills in Tasmania! 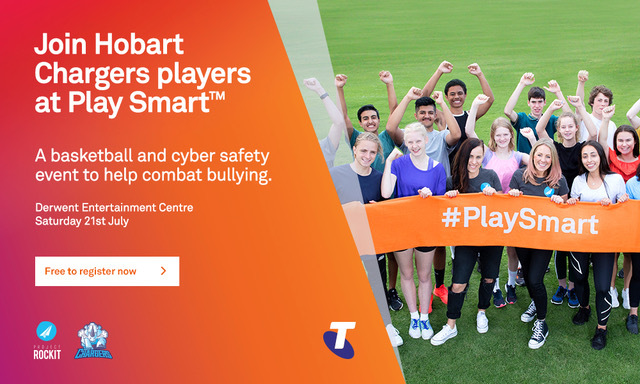 We'd like to invite you to register for Telstra Play Smart, a fun and interactive program for 12-16 year olds where they will meet Hobart Chargers players, practice basketball skills and learn how to tackle bullying head on - with cyber safety experts PROJECT ROCKIT. "EMPOWERING YOUNG PEOPLE TO STAND UP AND LEAD CHANGE"
Designed to inspire confidence, resilience and teamwork, the program will be held at the Derwent Entertainment Centre on the 21st of July. To register visit www.telstra.com/playsmart. Places are limited so book early to avoid disappointment.